Every year, April 27th is World Tapir Day, dedicated to raising awareness of one of the most wonderful non-conventionally-attractive mammals in the world. This photo is a Baird's tapir, my favorite, which lives in Mexico and Central America. (Well, this particular one lives in New Jersey, but you get the point.) There are three (possibly four) other species, all from the New World except for the Malayan tapir, the black and white one that you are probably familiar with, if you're at all familiar with tapirs. 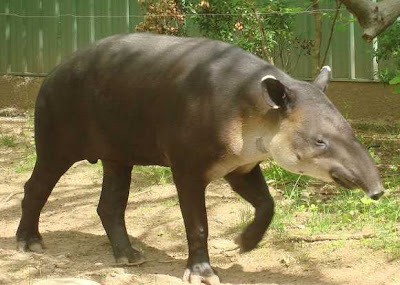 If you're not familiar with tapirs, of course, you're probably bewildered. 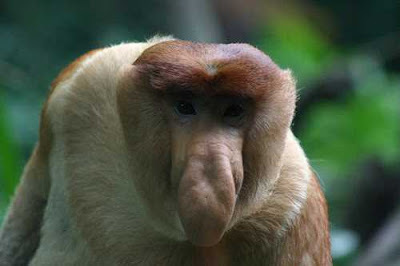 People often guess that they are anteaters or some kind of pig. In fact their closest relatives are horses and rhinos, but aren't they so much more wonderful? You can find out if your local zoo is having an event at the World Tapir Day Facebook page. Elsewhere on the web, you can find a ton of information (and an excellent gift shop) here. You might also like this webcam where you can sometimes see some Brazilian tapirs snoozing. If you thought the birds in the last post were having a bad hair day, check out this Phillipine eagle. At least those vultures looked like they'd just rolled out of bed, giving them an excuse. This guy looks like he's worked at it, and this is still the best he could do. This species is reportedly one of the most critically endangered in the world, but I am also a little worried about this particular specimen. 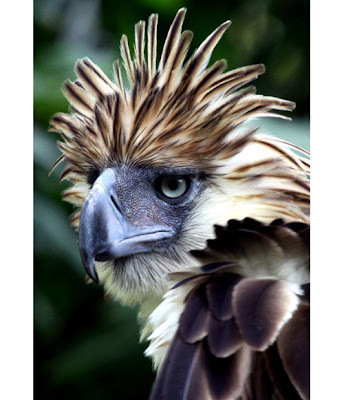 A resident of a conservation center, he's been given the name Binay, because he's been "adopted" by the Phillipine vice president Jejomar Binay. You'd think this would give him a leg up in life, but a little research revealed that the last vice president also adopted an eagle.... which died. But maybe the new VP can at least get this guy a hairdresser before it's too late? Thanks to the Telegraph's Pictures of the Day. 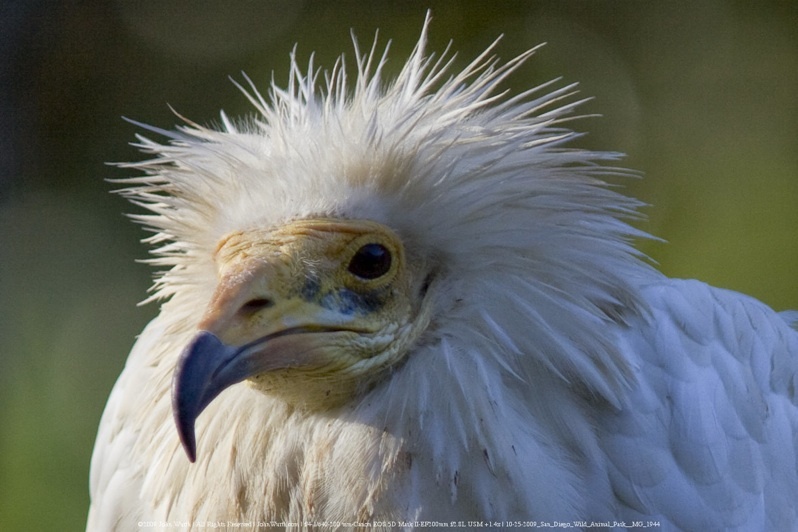 Meet the Egyptian vulture, also known as "Pharaoh's Chicken": the bird with a Ph.D. in egg-eating. 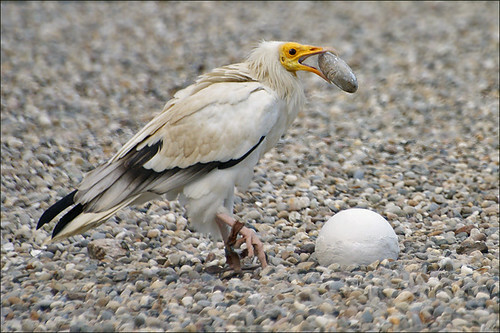 Egyptian vultures are best known for their technique of throwing or dropping stones on eggs to crack them, placing them among the few bird species to make use of tools. 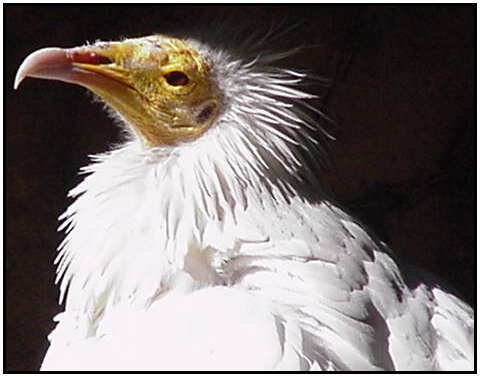 In addition to eating the eggs of ostriches and other large birds, Egyptian vultures also favor carrion, insects, decaying vegetable matter, and the feces of humans and other mammals. There was no evidence of cultural transmission for stone-throwing through copying experienced birds. A naïve captive-reared bird threw stones once an Ostrich egg had been linked with a food reward. The origins of aimed stone-throwing are probably related to the unaimed throwing of small eggs, since the actions are similar, and all tested birds strongly preferred to throw rounded or egg-like stones, rather than jagged ones, at Ostrich eggs. This video shows the Egyptian vulture plying its egg-opening technique (though this is only part of the multi-act drama that unfolds). This post is dedicated to reader OMBF's nose, whose size has drawn comparisons to a beak. 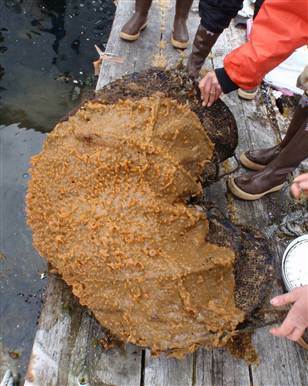 Scientists working on an eradication plan in Alaska are concerned because along with the ugly name and ugly appearance, this creature has ugly habits. 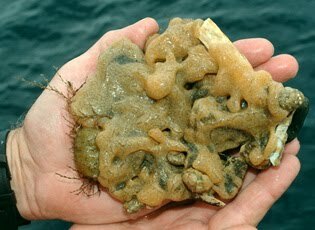 "It smothers other creatures while producing acidic toxins that in turn prevent anything from growing on it," a NOAA biologist told reporters. This behavior can kill many other animals that we like a lot better, including fish that are of commercial importance, reportedly since it interferes with their ability to feed. I think what they mean by that is that the fish can't get at their food, but you have to wonder, is it also because once they see this thing, they're too nauseous to eat? It's time for a full-length feature on everyone's (okay, my) favorite tiny primate: the tarsier. Those of you with nerdy inclinations will recognize them from the covers of O'Reilly's books on Vi and Unix. Tarsiers are small, nocturnal primates whose 4-7 species live in the islands of Southeast Asia, including Indonesia and the Philippines. Trademarks of their appearance are enormous eyes (which can outsize their brains), long feet (which give them their name--their tarsus [ankle] bones are extremely elongated), and long, spindly fingers. 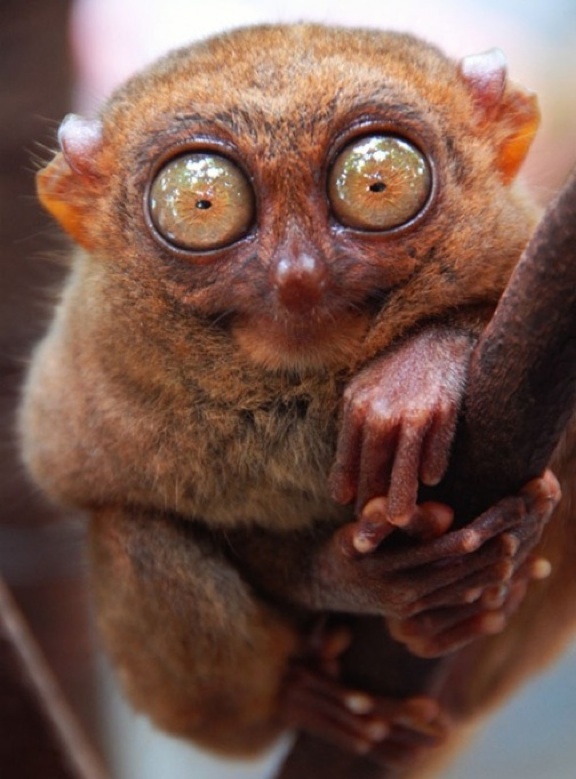 Tarsiers possess an abundance of exceptional traits. They can rotate their necks 180 degrees in either direction. They are the world's most carnivorous primate, exclusively eating live animals that include insects, snakes and other reptiles, amphibians, and even birds. 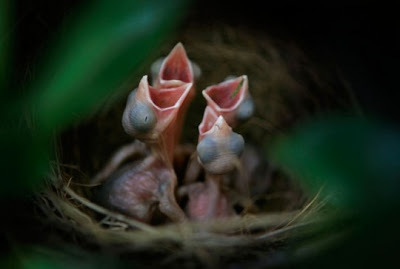 They are primarily insectivorous. They give birth to giant babies that can weigh 25-30% of the mother's weight (imagine a >30 pound human newborn!). According to Tarsiers: Past, Present, and Future, "Since infants are so heavy, mothers and other group members rarely transport them. Instead, a mother will park her infant on branches while she forages nearby." As if all this weren't enough, tarsiers have incited a raging century-long debate over their proper phylogeny, or relationship to other primates. Some argue that their morphology shows their close relatedness to strepsirrhine primates (e.g. lemurs, lorises, and bush babies). Another camp scoffs at such absurdity and cites genetic, anatomical, and reproductive traits that make them haplorrhine primates (e.g. monkeys, apes, and humans). Their ugliness factor also remains controversial; I personally find them to be utterly adorable, but, incredibly, others have ranked them the world's fourth ugliest animal. They've also been featured on these illustrious pages before. 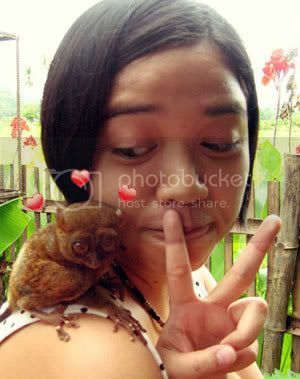 So here's to tarsiers! May they never lack for crickets to chew. Let's compare some baby birds found in the wild to their domesticated counterparts. First up is a set of Western scrub-jays, native to western North America, in their natural habitat. 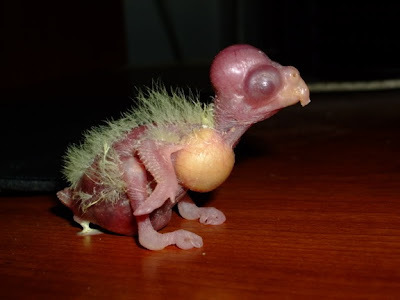 This is how I typically imagine baby birds: giant, gaping beaks, skin stretched tightly over bulbous eyes, optional pinhole eye openings, scrawny necks, and transparent skin. Observe the veiny skull, sealed eyes, wrinkly neck and leg, full crop, arthritic-looking claws, and Chia pet-style down. This is truly the stuff of which dream pets are made. 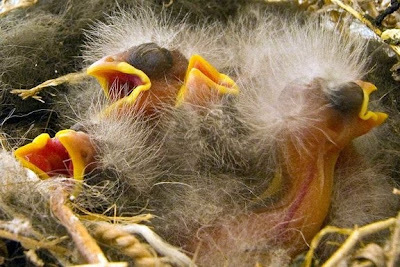 So who wins the ugliness contest: baby birds in the wild or baby birds at home? Cast your vote in the comments! A Japanese scientist studying a troop of these monkeys on Borneo has discovered that they regurgitate their food and basically chew their cud. They don't have the multi-chambered stomach designed for this like cows do, but they don't care. They do it anyway. Great angle on the nose in that, too, right? There are, of course, a lot of mosquitoes and leeches in the forest. The rainy season was the worst — the river water came up to our waists even inside the forest. It was really scary because at that time, crocodiles also came into the inland forest, and many creatures like centipedes and spiders came up to me on the water. Yeah, I think I'll stick with the blogging. Proboscis monkey in all his glory by Flickr user chem7 .